In a dense swampland in Georgia, just north of the Florida border, you find the headwaters of the Suwannee River. The Suwannee is known as a “blackwater river” because of its dark-brown waters laden with organic material. This river system has been called one of the most pristine in the United States, but some environmental pressures are putting that distinction in jeopardy. 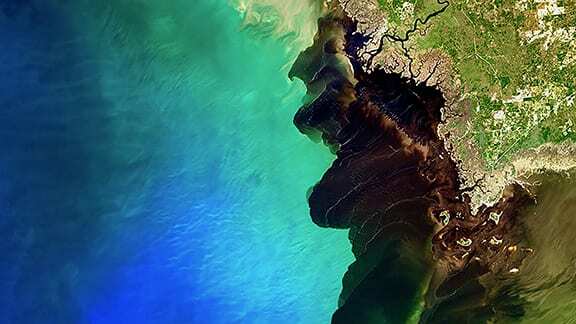 When the river finally meets the Gulf of Mexico along Florida’s Big Bend its dark waters act like a tracer, revealing whereby the river water mixes with the sea. That mixing was on display on February 20, 2015, when the Operational Land Imager on Landsat 8 captured this view. Image: NASA. Mikael Hiestand will present the results from his MS research, “Growing Season Synoptic and Phenological Controls on Heat Fluxes over Forest and Cropland Sites in the Midwest U.S. Corn Belt” in Michael Mann’s climate dynamics seminar Nov. 7 at 11:15 a.m. in 529 Walker Building. Dr. Arzu Çöltekin, from the University of Zurich, will visit the department and give a presentation, “Thinking About Visuo-Spatial Information Displays: Perceptual And Cognitive Considerations,” at 3:30 p.m. on Nov. 12, 2018, in 319 Walker Building. The GIS Coalition is hosting a YouthMappers Map-a-Thon on Nov. 12 at 6:30 p.m. in 208 Walker Building. All skill levels and majors welcome! Come join us as we map villages in Saint Louis, Senegal to help disaster relief efforts for water-borne illness. Drop-in for some pizza, drinks, conversation, and music! No laptop or experience necessary! SWIG is sponsoring a Thanksgiving basket for Students Engaging Students that will be delivered along with hundreds of others to multiple sites across Centre County. A basket is in 304 Walker Building to collect food items.You can sign up for an item here or just drop something in the basket. To make a monetary donation, there is an envelope in Michelle Ritchie’s mailbox. The last day to contribute to the basket will be Nov. 12. “Whose Baby Is It Anyway?” Conflicting Regimes of Care and Feeding in NICU Spaces in the U.S. In the Neonatal Intensive Care Unit human milk is considered a medical intervention in the treatment of premature and critically ill infants—yet barriers exist to providing milk, including the separation of the mother and infant, education, and traumatic birth experience. In this talk I revisit scale, territory and power beginning with the lactating body as a site of food production and the traumatized body as a territorial battleground in the Neonatal Intensive Care Unit. Drawing on feminist geopolitics, I examine how politics are written by and on bodies, and how power relations flow within and between them as sites of material exchange. Specifically, I consider the (geo)politics of infant feeding in the NICU, where there are conflicting regimes of care and feeding and there is friction between parents and NICU staff as each tries to attend to infant well-being. Using preliminary data from an online survey and early interviews with NICU staff in Delaware, I argue that the NICU is not an apolitical space and the structural barriers to breastfeeding and inequities in access to human milk are compounded in this public, controlled, and regulated space of infant care. When refugees use their mobile phones they leave clues about how well they are integrating (or not) into their host country. Clio Andris, assistant professor of geography in the College of Earth and Mineral Sciences, is analyzing a year’s worth of phone calls to find the clues to help address the Syrian refugee crisis in Turkey. Penn State University Libraries will celebrate GIS Day on Tuesday, Nov. 13, at an event aimed at the broader Penn State community — students, staff, faculty and community members — who are interested in learning about how geospatial information is being used on campus and beyond. All talks are held noon to 1:00 p.m. in 102 Chambers Building. Naegeli, T. J. and Laura, J. In this paper we present an extension to the Large Crater Clustering (LCC) tool set which places a cone of uncertainty around the trajectories of secondary impact craters to determine potential locations of source craters. The LCC tool set was a first step in the spatial quantification of primary and secondary cratering processes, which allows planetary geologists to accurately estimate the geologic age of a celestial surface. This work builds on the LCC tool set by accounting for the ambiguity of flight path trajectories through a Python script that leverages ArcGIS’s ArcPy library. We chronicle the mechanics of the script, which creates geodetically correct cones then counts them within equally sized cells of a vector grid. We describe the process that was used to derive the shape of the cone and provide parameters for the sizes of the cones and the grid. We demonstrate that the cone of uncertainty has the ability to compensate for error in secondary crater trajectories by introducing deviation in the trajectory bearing and comparing the predicted primary crater location. We use two study areas on Mars as well as the entire lunar surface to illustrate the usefulness of the extension as an aid to human interpretation of back-projections. The HIV/AIDS epidemic has taken on a new course in recent years with expanded access to antiretroviral therapy in the Global South. Although this transition is extending the lives of individuals for years or even decades, it is also creating new relationships between citizens and the state that are driven by resource needs specific to HIV management. This article details findings from an ongoing research project in northeast South Africa that is examining the social and ecological impacts of HIV/AIDS. Qualitative interviews are combined with ethnographic observations of a rural primary care clinic to document the ways in which residents and health care institutions are managing HIV. While initiating care for HIV-positive patients on antiretroviral therapy, clinics and other health care agencies advocate behavioral practices that challenge existing cultural norms and spatial economies, particularly in the realm of nutrition and food access. The importance of accessing certain foods is advocated as necessary for maintaining bodily health, yet this therapeutic citizenship confronts historical systems of inequality produced through spatial segregation. The consequence is that the coupling of drug provision with public health interventions produces uneven opportunities for health management that are mediated by cultural, ecological, and political systems in the era of managed HIV. This entry was posted on Tuesday, November 6th, 2018 at 11:19 am	and is filed under Uncategorized. You can follow any comments to this entry through the RSS 2.0 feed. Responses are currently closed, but you can trackback from your own site.